It could very well be that everyone else already knows this. I just learned about it today and find it odd. 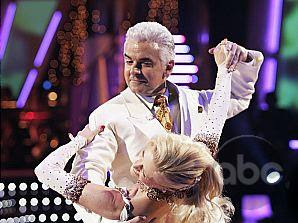 Actor John O'Hurley, seen above strangling a woman on the set of Dancing With the Stars, is best-known as having played J. Peterman — a fictional version of the catalog owner of the same name and Elaine's boss on Seinfeld. Since Seinfeld ended, O'Hurley has been busy performing in Spamalot and replacing Richard Karn as the host of Family Feud. More notably, however, when the J. Peterman Company re-launched after having gone out of business, it did so with O'Hurley on board as a co-owner. He is now at least nominally in charge of a business he once helped to parody. Also: Yes But No But Yes has posted a cool post detailing the whereabouts and whatabouts of several other Seinfeld alum. LMAO! You're unfamiliar with my humor! LMAO! For the first poster.......that's humor? No wonder both of us missed it! More lame than funny actually. Oh!!! I get it lmao. Its funny because its the opposite of true lmao. I have rocks in my head lmao!!! And "lmao" is only used by geeks, junior high schoolers, and paedophiles. OH MY GOD. All of you totally have permission to never come here again. Small world. Katie King (JJJ's old roommate) did freelance work for them last year. She got to draw elaborate sketches of a man in safari pants or a woman in a dowdy, high waisted dress. Apparently they have no photos in their catalogs. Hey, if you post crap on the internet and invite comments, then don't whine about the comments that you get!!!! I think it's pretty sick with all the violence in this country especially against women to even make fun of a man strangling a woman. If that is what you think passes for humor, get some help buddy. OMG! Exclam! Like, how COULD YOU, D?! There's, like, women strangled, like, every 2 and a half seconds! And, like, in that, like, picture thing commenty er-thing, you, like, made a comparison. That's, like, uber bad form! And then you TOTALLY LMAOed that uber righteous anonymous dude who was totally trying to help you out! Clearly, you need some, like, psycho-intervention! I forgot my multiple exclamation points!!11!!!11! Also: uber pwnge! I think!